In case there was any remaining doubt, my youth has officially ended. 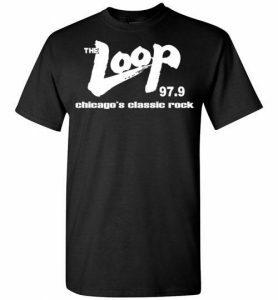 That was my first thought after learning this week that The Loop, one of Chicago’s most iconic radio brands ever, announced that it was selling to a Christian broadcasting company and changing formats after a remarkable 41-year run. The Loop was not just a radio station, it was an institution. It epitomized the fabric of Chicago: edgy, in-your-face, hardworking, rocking-with-attitude, and having a ton of fun along the way. I have always been somewhat of a radio junkie and during my formative years, The Loop played a huge part in shaping my life. The same is probably true for many people who grew up in Chicago from the late 1970s through the 1990s. Almost everyone in my neighborhood used to walk around wearing those legendary black and white Loop T-shirts and raid the Flip Side record store for free Loop bumper stickers—the same stickers that were plastered all over my bedroom, much to the chagrin of my parents. Every male’s first crush was on Lorelai, the Loop rock girl, and we all acquired a healthy hatred of disco, courtesy of Disco Demolition. Not only did The Loop launch my love of rock & roll music, but it was also my link to the older, cooler kids. Our affection for the station was a common bond that helped me gain acceptance into their crowd. I felt like I was part of an exclusive club, listening to things I clearly had no business knowing about at a young age. Since there were no podcasts or on-demand services back then, I would rush home from school every day to listen to Steve & Garry, as I did not want to miss a single word. To this day, I am convinced that I learned more from listening to this station than from my classes. While legendary disc jockeys such as Bobby Skafish, Sky Daniels, Patty Haze and Bob Stroud were spinning tunes, the true game changer for me was when I first heard Jonathon Brandmeier in the morning. I would think, “Wait, can you really say and do these things on the radio?” Jonny B’s show was simulcast on the new Loop, AM-1000, which was a personality-driven talk and entertainment station unlike anything ever on the airwaves. Who knew talk radio could be funny? Talents like Steve Dahl, Garry Meier, Kevin Matthews with his alter ego Jim Shorts, Buzz Killman, Bruce Wolf, and Chet Coppock comprised arguably the greatest radio station ever. While these days I prefer to Hit ‘em with the Hein on Sirius XM due to the sad state of Chicago radio (a blog for another time), I would still listen to the Loop whenever I needed a classic rock music fix and it was always reassuring to know the station was there. In its own special way, the Loop was as much of the fabric of Chicago as the Bears, Michael Jordan, Wrigley Field, The Mag Mile, Lake Michigan, and so many of our amazing skyscrapers along the beautiful skyline. Just as 233 South Wacker Drive will always be the Sears Tower, 875 North Michigan will always be the John Hancock Center and Macy’s will forever be known as Marshall Fields, FM-98 will always be the Loop to me no matter what is broadcast over its airwaves. Long live rock, Chicago and the Loop.